Concluding a four-day mission to Democratic Republic of the Congo (DRC), the United Nations High Commissioner for Human Rights, Zeid Ra'ad Al Hussein, today commended the country's efforts to strengthen human rights but cautioned that some of these advances may be under threat, especially what he saw as repression against opposition parties in the coming elections. While noting that important advances relating to impunity for sexual violence are in line with broader progress in the DRC since he had first visited the country, in another capacity, in 2004, he said that as crucial electoral deadlines approach, there is rising tension. “I receive reports of increasing violations of fundamental civil and political rights by State actors. These notably include violations of freedom of expression and of peaceful assembly – rights anchored in the binding international treaties to which the DRC is party, and enshrined in the Congolese constitution. The public space for the expression of dissent is now clearly under pressure,” Mr. Zeid continued. He said he is also very concerned about reports of increasing harassment of civil society representatives and journalists, as well as the repression of voices which oppose the Government,” Mr. Zeid told journalists in the Congolese capital, Kinshasa, at a press conference at the end of the mission. He also briefed the journalists that he noted a number of important commitments made by senior Government officials and stressed that it is vital that they are implemented. The High Commissioner underscored that his Office (OHCHR) is ready to support the Government in strengthening human rights in the country. During the visit, Mr. Zeid also travelled Panzi Hospital in Bukavu where he met with women survivors of sexual violence, and with Dr. Denis Mukwege, a Congolese doctor who has treated more than 40,000 victims. The visit coincided with the 20th anniversary of the OHCHR presence in the DRC, the largest OHCHR field presence in the world. While Mr. Zeid noted a number of positive steps, he also spoke of challenges facing the central African country. On one of the pressing challenges, the forthcoming elections, he said that he supported President Joseph Kabila's call for a national dialogue, which the High Commissioner said must be open and honest. “[The] dialogue simply cannot take place in an atmosphere which stifles discussion and the airing of all grievances and opinions [and] where independent media and respect for fundamental freedoms are being threatened,” he said, and urged that respect for the human rights of all is should be at its core. He called for legal guarantees that would allow people to express their views and work together without fear of retribution by the security forces or judicial authorities. He also called on the police forces to refrain from any use of lethal force during peaceful demonstrations and said that crowd control means should be based on the principles of necessity and proportionality. Mr. Zeid hailed the youth of the country as its greatest asset and urged that they must be encouraged to contribute to it. He said that those who speak out must not be oppressed for expressing their views. The High Commissioner further expressed appreciation for the country's reception of over 25,000 refugees from Burundi in recent months. “I see this as a pivotal moment,” the High Commissioner said of the coming polls, stressing that the DRC is a country with tremendous assets – including, not least, the legendary drive and creative ingenuity of its people. “If it can build a momentum in terms of human rights protection, democracy and rule of law for all, the DRC has the potential to shape a strong and cohesive society – one which truly benefits all its people. If it stumbles into increasing repression, mistrust and grievance, however, there is also the possibility the current political uncertainty could lead to serious crisis, which could undo many of the gains made by the Congolese people,” the High Commissioner warned. 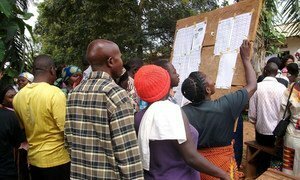 In the lead up to the Democratic Republic of the Congo's (DRC) scheduled presidential election in November, the Security Council today expressed concern at the recent arrests and detention of members of political opposition and of the civil society.